Our 7th interview podcast from HOW Live (recorded in Boston), brings us Hatch Design. Talking with Joel Templin and Katie Jain is a true pleasure. I mean, Ben and I were impressed enough with their incredible design work – but they do so much more. We speak about the idea behind Hatch, being an incubator of ideas, and starting up your own brands. Special thanks goes out to the wonderful staff at HOW for helping us out during the conference, and setting us up with a great room to interview from. And as we end our 5th season of The Reflex Blue Show, we bring back (for a 22 minute end track) Nate Voss! Around 7 years ago, we started up (along with Tom Nemitz) the Be A Design Cast, and we’ve been podcasting ever since. In one sense, it’s hard to think that we’ve recorded 100 of these shows – in another sense (with the specials and the BADCast recordings), it’s even weirder to think we’ve released like 196 of these shows. We really have to thank all of our listeners, and our guests for making the show what it is. So, thank you. Leaving the AIGA Nebraska board near the end of 2008 was something that was a bit difficult. After 7 years of volunteering though, I knew it was time to move on. I’m happy to see the chapter continue to do a lot of great things, and this week they did one I was very impressed with indeed – the Vivo Design Thinking Workshop with the Good Samaritan Society. AIGA president Craig Hughes not only was a big part of getting this event off of the ground – we need to thank him for lining up our guests for this podcast special. So what is this Vivo Design Thinking Workshop? It was a three day, 60 design thinkers event to come up with how to best use 30 acres of land to build a senior facility. And who better to discuss it with us than AIGA President Doug Powell. Well, maybe Bill Anderson from the Food Samaritan Society, who joins us for the second half of the show. Follow Vivo Innovation on Twitter to get updates as this project progresses over the years. As for the first half of the show? In addition to Vivo, We talk Runza (photo above from the Trashy Travel tour of Nebraska), the upcoming AIGA Gain conference, and more. Oh, and it’s been fun to see one of our favorite guests, Justin Ahrens (photo also above), bringing his speaking appearances up to the high level of his design skills over the years. The work he’s put in on speaking engagements has really shown the past times we’ve seen him, as not only is he speaking at Gain (and deservedly), when this event needed to bring in a speaker great enough to motivate and inspire 60 super talented design thinkers for a lunch keynote, they brought in Justin. And we stole him for the first half of this show. Next weekt? 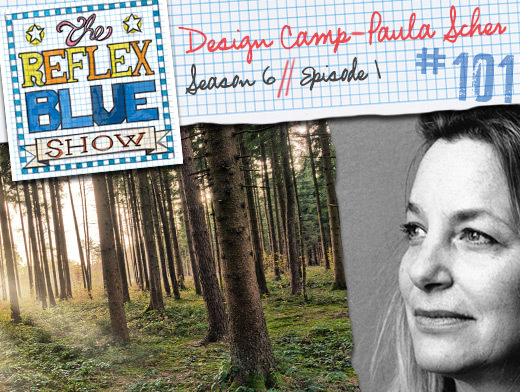 Hatch Design joins us for our final HOW Live, and season 5 finale – The Reflex Blue Show #100!